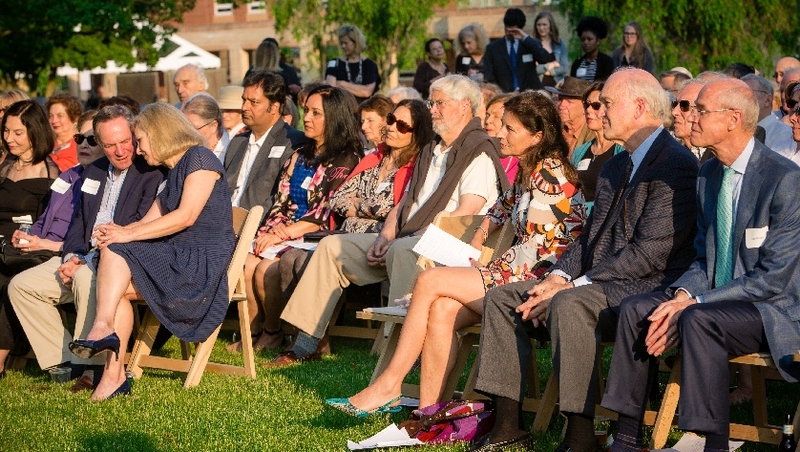 Friends of the Institute for Advanced Study are a welcome addition to the IAS community and are encouraged to participate in its intellectual and cultural life through invitations to lectures, concerts and films, and other scholarly and social gatherings. Information regarding campus resources and events can be found below, and questions may be directed to friends@ias.edu. We look forward to welcoming Friends to the Institute campus. Parking and other helpful information can be found on maps of the Institute campus and Institute Woods. Friends may use the IAS Dining Hall, which serves lunch from 12:00 to 1:30 p.m., Monday through Friday, and 12:00 to 1:00 p.m. on Saturday during term. Dinner is served on Wednesday and Friday evenings during fall and spring terms. The bar opens at 6:00 p.m., and seating for dinner is between 6:00 and 8:30 p.m. Dinner reservations are required, and we suggest you reserve early. When you dine at IAS, please bring your Institute ID card, which is required for purchasing food and drinks. The Edward T. Cone Concert Series is curated by Artist-in-Residence David Lang. Noted composer, teacher, pianist and author Edward T. Cone, for whom the Institute’s concert series is named, was a Founding Friend of the Friends of the Institute for Advanced Study and a tireless supporter of the arts and humanities at the Institute and elsewhere. Concert performances take place in Wolfensohn Hall and are free and open to the public. Click here to register for concert tickets. The IAS film series offers the Institute community the opportunity to hear from the producers, creators, and curators of film. Film screenings in Wolfensohn Hall are free of charge. In addition to the Institute’s public events, Friends are invited to the IAS campus for Friends Talks, informal lectures, and other scholarly and social gatherings. Visit the Friends events calendar for more information and to register for events. Friends are extended the privilege of using the HS/SS Library, which contains approximately 100,000 volumes and has subscriptions to about 1,000 journals. The Library is open from 8:45 a.m. to 4:45 p.m., Monday through Friday. If you want to use the library, kindly introduce yourself to Marcia Tucker, who will arrange an orientation. The invitation does not include borrowing privileges. All Friends receive Institute ID cards, which provide access to the Dining Hall. The card must be used to purchase lunch, cocktails, and dinner. Friends will be billed for dining charges on a monthly basis. One way to stay connected to the Institute and the work of its Faculty and Members is to view IAS publications, such as The Institute Letter, Faculty and Members booklet, and the Annual Report. If you would like to use the Institute tennis courts, please contact Pamela Hughes at (609) 734-8204 or friends@ias.edu to arrange access. Videos of past Institute events and public lectures, including Friends talks, are available to view on the IAS website. Click here for an inside view of the Institute for Advanced Study.